Have you ever wondered what it would be like if all of the gingerbread cookies got together during the holidays and had a big party? I'm sure there would be dancing cookies and palace ballrooms and colorful characters. I'm sure it would look a lot like The Frelinghuysen Arboretum's Gingerbread Wonderland. This post is updated yearly, so feel free to Pin it for future use! What is The Gingerbread Wonderland? Running every December, Gingerbread Wonderland is held at the Frelinghuysen Arboretum in Morris Township, New Jersey. 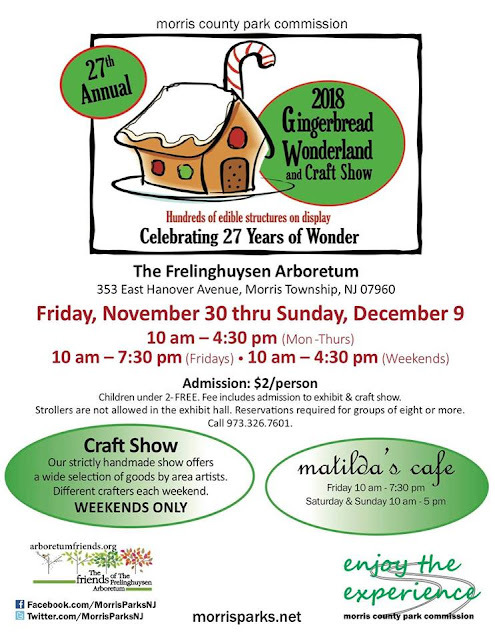 You can see delicious gingerbread creations on display, and visit their craft show on the weekends. Check their website or Facebook page for hours of operation and other important information. As of the publication date of this post, there is an entry fee of $2.00 per person, which also includes admittance to the craft show on weekends. Children 2 and under are free. But as always, check their website for all accurate details before attending. You really have to stop to admire the time and detail that the artists put into their work. Everything is edible! (well, you can't eat it, but you can eat, if you know what I mean). You'll also have the opportunity to vote for your favorite piece. But how do you choose just one??? Made by some talented students at Ridgedale Middle School! Are you ready to choose your favorite? I know, so hard, right?? There is a craft fair on the weekends (weekends only, see below for info). I had heard Matilda's Cafe closed, but this flyer says they are open at select times. You might want to call in advance to be sure if you planned on visiting the cafe. Of course, seeing all of that cool gingerbread art inspired us to make our own, so you might want to plan ahead and have your gingerbread supplies ready when you get home. Oh, and I HIGHLY recommend pre-made gingerbread houses if you're working with little ones. Wilton makes a pretty good pre-assembled kit that we purchase every year. If you don't buy a pre-assembled kit, my other tip is to use a hot glue gun to put your pieces together (but know that you can't eat it after that!). You can hide the glue with your frosting and decorations. Works like a charm! For more tips on building a better gingerbread house, check out my gingerbread house blog post! As I mentioned before, be sure to check out my post of tips and tricks for easy gingerbread house construction here! They don't allow strollers, so leave them at home. This event can get very crowded on weekends, so plan accordingly and arrive early if you can. We attended during the week (around 1:30pm) and crowds were not bad at all. I gave my son the pep talk before we entered, which basically consisted of, don't touch anything! Know that if you're going with very young children, the desire to touch might be really difficult for them to control. Encourage your kids to walk slowly and really look at each piece. My son wanted to race through the whole event, so we walked around a few times to really enjoy everything. There is a craft fair available on the weekends, and your admission fee allows you to attend, so get in there and shop local! Interested in participating next year? Check out their website for instructions and applications, or talk to one of their many employees or volunteers at the event. Everyone was friendly and helpful when we attended. Pinewood Derby made by Kinnelon cub scouts!